Was Ken Molson born with the dream of flying? Or did he acquire the taste, little by little, just as he collected photographs on aviation themes, little by little, over his lifetime? Ken Molson’s personal archives were donated to the Canada Aviation and Space Museum in 1996 and were later certified as Canadian cultural property. The archives cover the entire history of aviation, up until the point when Molson was no longer able to collect. Photographs from his collection, up to the year 1948, are now available in Ingenium’s Digital Archives. Molson learned to fly at the Curtiss-Reid Flying School at Cartierville. Among the first photographs published from his collection in the Digital Archives, there are about 50 images from Cartierville in the 1930s; this was the time when he was earning his pilot’s license. As a passionate collector of Canadian aviation heritage, Molson also found photographs from before his time. For example, he acquired photographs documenting the early work of the Aerial Experiment Association in Baddeck, Nova Scotia. J.A.D. 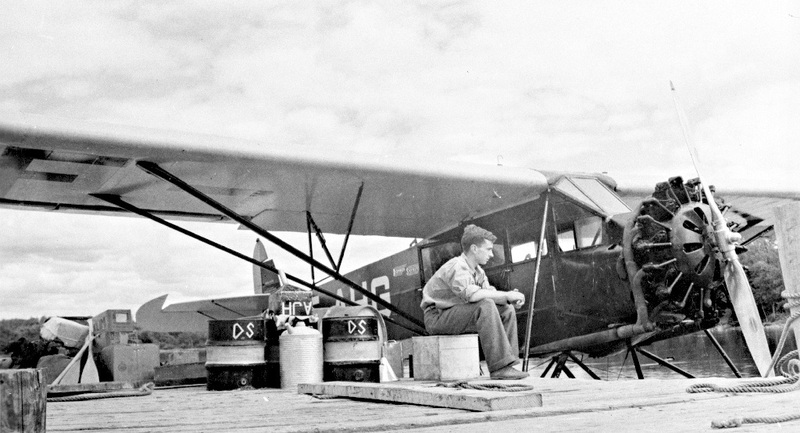 McCurdy sitting at the controls of the Aerial Experiment Association’s Cygnet II. He also found photographs documenting Charles Willard’s famous flight in Scarborough, Ontario in 1909, where he made two false attempts before he managed to get airborne over Lake Ontario. The excited crowd blocked his landing strip and Willard was forced to crash a third time in the water. Later in the 1930s, before moving on to study at the Boeing School of Aeronautics in Oakland, California, Molson worked as a mechanic for Dominion Skyways in Rouyn, Quebec. Celebrated First World War ace Billy Bishop was Vice-President of this company, and Ken’s cousin, Hartland Molson, was one of its founders. Evidently, a difficult task like changing out the engine of a float plane was not enough to dampen his enthusiasm for the field. As an engineer, he worked for National Steel Car, Victory Aircraft, and then A.V. Roe Canada. He gathered photographs and took a few himself of the work, employees, and products of these companies. In 1960, Ken Molson became the first curator at what was then called the National Aviation Museum. He guided the museum as it built its collection, and continued to gather his own personal collection of archives. These materials range from his collection of Boy’s Own books on aviation adventures to his last files for articles he wrote in the early 1990s. In the future, we will continue to release more photographs in the Digital Archives from this collection, little by little, as our cataloguing and copyright research continues.